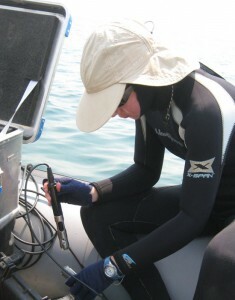 Wright State Ph.D. student Brianne Kelly taking oxygen measurements at Lake Tanganyika in east Africa. Lake Tanganyika in east Africa is the second deepest lake in the world. Most of the lake’s massive volume of water sits in its dark depths, where a lack of oxygen makes it impossible for fish and other animals to live. But swimming near the well-lit shoreline is one of the most diverse freshwater fish communities in the world. The lake boasts nearly 275 species, many of which are highly sought after aquarium pets. The abundant, complex fish community of Lake Tanganyika is the freshwater equivalent of a coral reef. Paradoxically, the clear, shallow waters at the lake’s edge lack the nutrients necessary for the growth of the algae that are the main food for the fish. This seemingly contradictory situation is the basis of research work by Yvonne Vadeboncoeur, Ph.D., an associate professor in Wright State’s Department of Biological Sciences who specializes in aquatic ecology. She believes the answer may lie in the grazing fish themselves. Vadeboncoeur said the fish continually excrete small amounts of nutrients as waste products. And several times a year, there is an injection of new nutrients when strong winds cause deep water to come to the surface. Two graduate students in her lab, Sam Drerup and Brianne Kelly, recently completed a nine-week stay at Lake Tanganyika, where they conducted field experiments to test whether the grazing fish increase the nutrient turnover and retention that boosts the productivity in the lake. The work is financed through a three-year grant of $850,000 from the National Science Foundation in collaboration with Peter McIntyre, Ph.D., a fish ecologist at the University of Wisconsin. The grant supports two students in the Environmental Sciences Ph.D. Program at Wright State. Vadeboncoeur said testing the importance of fish in sustaining lake productivity requires measuring nutrient storage and recycling by fish, experimentally testing whether algae grow faster when fish are present, measuring inputs of nutrients from the depths of the lake, and using theoretical models to compare the importance of fish and other sources of nutrients. The research is being pursued in the field in Tanzania and in laboratories in the Department of Biological Sciences at Wright State. Fishermen are catching too many fish in many lakes worldwide, including Lake Tanganyika. This overharvest may remove too many nutrients from the lake or reduce the rate of nutrient recycling so that algae grow more slowly. By that mechanism, fishing could actually undercut the future productivity of the lake. Climate change is warming the surface waters of the lake and reducing the seasonal winds that cause nutrient-rich waters to periodically rise up from the depths of the lake. Reduction in the influx of these deep-water nutrients is cutting off the algal growth that sustains the fish. She said the project constitutes the first thorough evaluation of how these human-imposed factors will affect the productivity of Lake Tanganyika, which supports a regional human economy. The research also will increase public awareness about the lake’s aquatic life through a website and scientific and magazine articles. Vadeboncoeur, with more than 25 years of teaching and research in environmental science, is particularly interested in the biological aspects of how organisms like fish interact with and are affected by their environment. Lake Tanganyika, in addition to being the second deepest lake in the world at about one mile, is also one of the largest freshwater lakes in the world. At 418 miles it also is the world’s longest lake, with its primary borders being the African countries of Tanzania and the Democratic Republic of the Congo. In addition to Africa, Vadeboncoeur has conducted aquatic ecology research in Ohio and several other areas of the United States, plus Greenland, Canada and Europe. Vadaboncoeur holds bachelor’s and master’s degrees in zoology from the University of Montana and a doctorate from Notre Dame in aquatic ecology. She completed postdoctoral work at McGill University in Montreal and earned an NSF fellowship to study at the National Environmental Research Institute in Denmark.